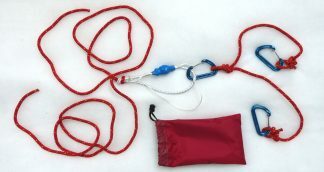 Our simple and lightweight compass holder allows a skier or orienteer to travel and navigate without the need to use their hands. The compass is supported, hands-free, in front of the chest where it can be easily read and adjusted whilst on the move. The holder is designed for baseplate compasses 60 mm wide and 4 mm thick. Short and long versions are available. When leaning forward whilst hauling a pulk, it is more convenient to have the compass mounted further ahead, making it easier for sighting forward. The shorter length may be more convenient for walkers and orienteers.